Universiti Teknologi PETRONAS (UTP) was established in 1997 and has grown to be one of the most prominent private universities in Malaysia. UTP offers wide range of industry-relevant engineering and technology programmes at undergraduate and postgraduate levels. Universiti Teknologi PETRONAS (UTP) was established in 1997 and has grown to be one of the most prominent private universities in Malaysia. UTP offers a wide range of industry-relevant engineering, science and technology programmes at undergraduate and postgraduate levels and aims to produce well-rounded graduates with excellent leadership qualities and communication abilities. UTP has produced more than 10,000 graduates and currently has an enrolment of over 6,000 undergraduates and 1,200 postgraduates from more than 66 countries around the world. In less than two decades since its establishment, the university has attained prestigious national and international recognitions. UTP is the only private university in Malaysia to be ranked in the top 160 under the Quacquarelli Symonds (QS) University Rankings: Asia 2015 and was ranked at 288 for the 2015 QS World University Rankings under the Engineering and Technology Faculty. UTP has made a commendable achievement in the QS World University Rankings by Subject in 2016. QS has recognised UTP as amongst the world’s elite institutions in four of the 42 subjects featured in this ranking. 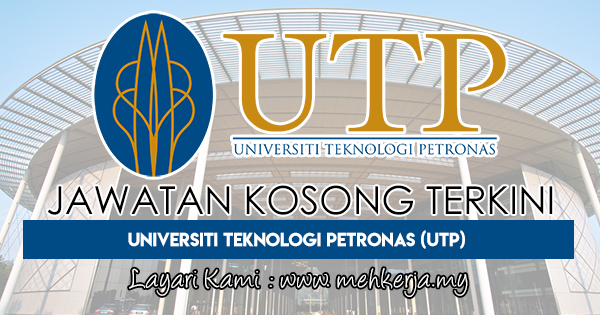 0 Response to "Jawatan Kosong Terkini di Universiti Teknologi PETRONAS (UTP) - 25 Mac 2018"